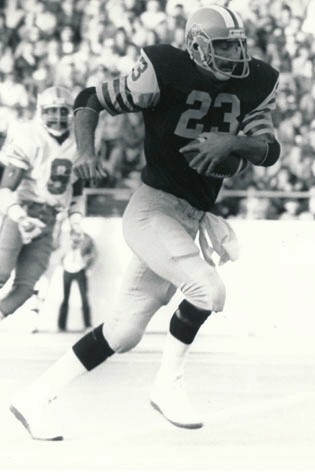 The star Slotback of the University of Ottawa, Rocky DiPietro, signed with the Hamilton Tiger-Cats in 1978. During his 13 year career as a Slotback and Wide Receiver, DiPietro became the CFL’s all-time pass reception leader in 1989 and had a career total of 706 receptions for 9,762 yards and 45 touchdowns. At the time of his retirement, DiPietro held the Tiger-Cats team records for most career pass receptions and reception yards. In 1982, 1984, and 1986, he surpassed 1,000 yards in pass receptions. Rocky DiPietro retired in 1991 after starring in four Grey Cup games. Rocky DiPietro was named to the Tiger-Cats Walk of Fame in 1994.